Still a better story than Twilight. 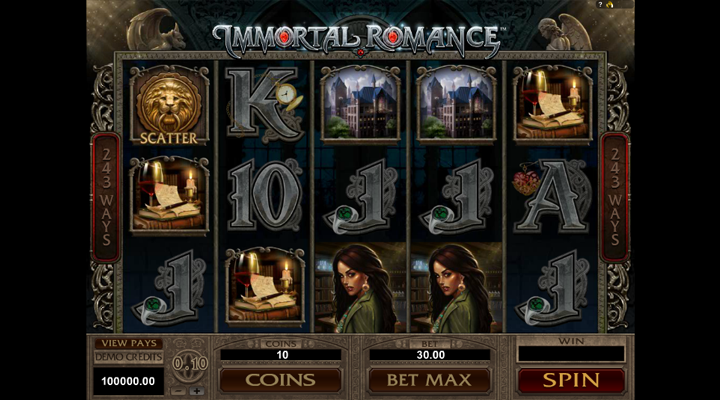 Immortal Romance is Microgaming’s way of seeing an opportunity and making a great game for it. Loosely based off the Twilight movie, this slot is popular not only for it’s clear references to the film, but also because it actually has a very cool free spin feature where, depending on how many times you’ve visited the Chamber of Spins, you’ll be able to select from four different free spin bonus types. We can’t stand the movie, but this slot isn’t bad at all. Immortal Romance is a creation of Microgaming and it’s hella popular. We figure that this slot has the same popularity level that that awful Twilight movie series. In fact, upon closer inspection, this was probably influenced by that terrible film, but thankfully, the slot adaptation is far better. Come to think of it, Twilight folks probably play this specific slot because of all the similarities… well, it doesn’t really matter because the game and bonus feature will keep you playing. The symbol you’ll really want to be paying attention to is the door knocker thing. This scatter symbol can award you with a sick win. This symbol also unlocks the bonus game. The Immortal Romance logo is going to be your wild symbol for this slot and it’ll take the place of everything except the door knocker thingy. The free spin feature is definitely worth mentioning in more detail and there are actually four of these bad boys, all of which take after the characters in Immortal Romance and will have their own special bonuses. The other thing to note is that you unlock these at different stages, which depends solely on how many times you hit the free spin stage. Genius game design! Amber: 10 free spins. All of your wins will be 5x and you can even re-trigger these spins. This is the one you’ll get on your first go-around. Troy - 15 free spins and you’ll get to use the Vampire Bats feature as well. This will let you (or the bats) change the symbols from 2x or 3x multipliers. You’ll be able to select this one when you’ve to the Chamber of Spins five times. Michael - 20 free spins. (Getting the pattern, yet?) You’ll get a rolling reels function and if you hit consecutive wins, they’ll get a multiplier of 5x. When you hit the Chamber of Spins on the 10th time, you can select Michael. Sarah - 25 free spins and you’ll get a Wild Vine symbol that will randomly switch symbols from worthless turds into wilds. (Only on the 3rd reel, though.) On your 15th go-around of the Chamber of Spins, Sarah will be available. That’s a hell of a free spin bonus game! Sure, it’s loosely based on Twilight and it totally rips off the art style and characters. That said, it has a very compelling free spin feature and as much as we’d like to make fun of it for being related to Twilight, we really can’t. Click here to see what Immortal Romance will bring you.